Are we a body with a mind, or a mind with a body? This may sound like a chicken-and-egg type of conundrum, but it’s a deep philosophical question. The concept of the separation of the mind from the body is known as dualism, and has been debated for centuries because the answer to that question then guides a lot of other philosophies and theories. Dr Caroline Leaf is a communication pathologist and a self-titled cognitive neuroscientist. She believes that the body and brain are separate from the mind, which significantly influences her teaching. Take, for example, her social media meme-of-the-day today. 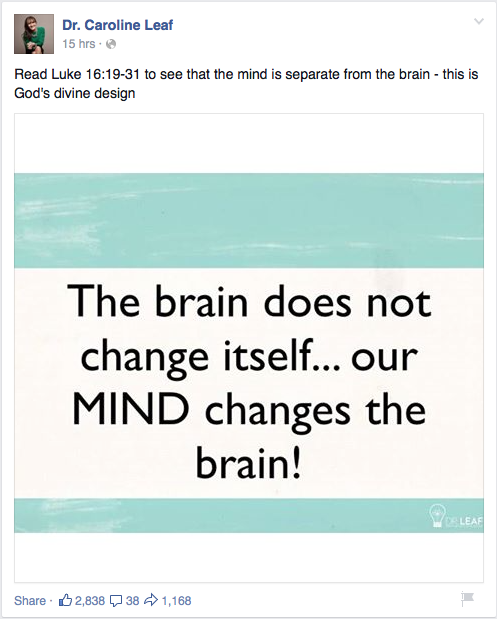 She posted that, “The brain does not change itself… our MIND changes the brain”. If one assumes that the mind is separate from our brain, then its plausible that the mind influences the brain. Except that it doesn’t. Our mind is a product of our brain, not a separate entity. Neurological damage from injuries or tumours, electrical stimulation of the brain in the lab, the effect of illicit drugs on the brain like LSD or marijuana, and everyday examples like the changes to our thinking under the influence of caffeine or alcohol, all prove that changes to the structure and function of the brain change thought patterns. It isn’t the other way around. Every brain changes itself too – the brain of an embryo or foetus undergoes massive changes but foetuses don’t have streams of conscious thought. Dr Leaf’s meme is scientifically misguided. There are a number of scriptures that theologians use to discuss the biblical basis for the separation of the body and soul, but Luke 16:19-31 isn’t one of them. That passage is the parable of Lazarus and the rich man. I’m not sure exactly where the convincing proof of the separation of our mind and our body is found in this passage. This is a description of the afterlife, and in this parable, the rich man was very specific about memories (“I have five brothers …”) as well as physical sensations (“I am in agony in this fire”) and even parts of the body (Lazarus’s finger, his tongue). Jesus isn’t telling a story of how the mind is separate to the body, but of a different dimension in which the body and the mind are still together. This passage isn’t proof for the concept of dualism, but against it. Dualism also has a number of fatal scientific and philosophical flaws, in particular that dualism is conceptually fuzzy, experimentally irrefutable, considers only the adult mind, and violates physics, in particular the law of conservation of energy. So Dr Leaf bases her teaching on a scientifically and philosophically untenable concept and then attempts to use a scripture which refutes dualism in her attempt to support it. That’s audacious, but then to claim that it’s God’s divine design is, at best, a little brazen. Dualism may be one of her fundamental philosophies, but I think Dr Leaf should review the basis for it, and possibly reconsider her reliance on it. This entry was posted in Biological, Caroline Leaf, Psychological, Spiritual and tagged brain, caroline leaf, criticism, dr caroline leaf, Dr Leaf, dualism, lazarus and the rich man, luke 16:19-31, meme, mind, social media, soul by cedwardpitt. Bookmark the permalink. Very informative blog. I agree that the evidence is overwhelming for the mind (or consciousness) being an emergent property (or feature) of the brain. From personal experience (I realise this is anecdotal evidence), babies appear to have no mind, as an adult would define it, until they are 10-15 months old. The mind appears to take a long time to get programmed and then emerge like software running on a computer. However, I still wonder why we experience anything at all – why is there conscious experience? It seems bizarre and unnecessary. Why aren’t we simply robots/computers that, while acting in a sophisticated way, are mindless? For me, the subjectivity of human consciousness is the problem. Most of what humans do is not consciously decided upon, e.g. breathing, heart beating, digesting food, etc. But a small bit of what humans do is consciously decided upon and most of what we see, hear, feel, etc. is consciously experienced. Explaining consciousness seems to be the one unanswered mystery of human experience, which does leave the door open (ever so slightly) for supernatural explanations (although I am highly skeptical – extraordinary claims require extraordinary proof).